← Put a little “Love” Into your Locks! 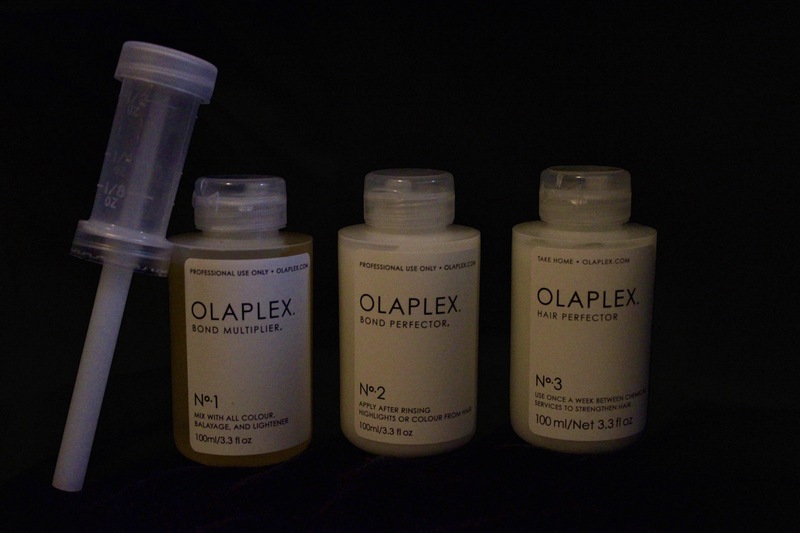 Almost one year after this announcement came across major media channels salon clients and even some professionals are still not sure of what Olaplex is, how it works, why we need it, what’s the difference between the three formulas, and where to get it. To bring you up to speed…it is not a conditioner, it is a bond builder. There are no silicones or “Ydes” in this organic compound. A bond builder is a reset button for hair that will bring it back to it’s healthiest state or can be used as a pre-treatment to prevent it from being damaged in the first place. When I think of Bond, I naturally think James Bond. 007 will give you a fast fix for your head but I digress… your hair needs a licensed colorist sporting No. 1, 2, & 3 by Olaplex. Molecular forms of bonding are similar in that they involve some “playing & pairing” but it’s more of the scientific kind. Here is how it works. Scientists discovered a new set of molecules that creates a buffer between your hair and the chemicals that harm it during a permanent-color processing or perm. When peroxide breaks down the door and enters the hair shaft to lighten your natural pigments and make room for the color you want, it also splices apart disulfide bonds that make hair strong and resilient. These once connected pairs are uncoupled and turn into single sulfur-hydrogen bonds. Are ya still with me? Good. If one oxygen molecule created by the peroxide reaction hooks up with one of these singletons, no harm occurs. However, approximately 50% of the time…it’s killed. Oxygen molecules move in packs of three’s, and when these minuscule predators attach to the vulnerable sulfur-hydrogen, they trigger a reaction that eats protein out of the hair, leaving it dried and fried. Olaplex eliminates that reaction. In the little bottles of liquid your colorist adds to two steps of your regular re-pigmenting process is one AMAZING ingredient – a chain of carbon, oxygen, nitrogen, and sulfur with two reactive ends that love sulfur-hydrogen bonds. When it is mixed into the hair color, it couples with them faster than oxygen can, creating a new bond that is actually stronger than the originial disulfide ones. The health of the hair is maintained, and the oxygen simply dissipates because it has no one to play with. Why do we need it? Bonds get broken inside and outside the salon. Inside the salon as noted it is used by professional colorists to create Balayage, High lift Color or Highlights in the salon without damage. An experienced colorist may use it during a corrective color on a new client. Outside the salon harsh chemicals, environment, or heating tools used at high temperatures can break new bonds. At that point an in salon pre-treatment at the next color or hair service appointment can repair them. No. 3 is recommended to be used at home once a week by the client to maintain strength in-between chemical services it consists of 12.8% Olaplex in creme solution. No. 1 is a bond multiplier and is 100% Olaplex concentrate, No. 2 is a bond perfector with 15% Olaplex in creme form, they are used in conjuction by your colorist for flawless results. Adminstered properly and used as directed by both colorist and client Olaplex can equal out the porosity of hair, cure frizz, bring life back to curls, and keep pure pigments in longer. Olaplex is not just for color clients. Permed hair, chemically straightened/smoothed by keratin treatments, or clients with real hair extensions can benefit from this pre-treatment and take home product. No. 3 can be used on the hair 10-30 minutes prior to shampooing and conditioning the hair, left in over night and then shampoo & condition, or add just a few drops in the bottom of your palm and scrunch into the hair after it is dry and styled. Applying heat while Olaplex is on the hair is not recommended. Where can I get it? Often times if you ask, your colorist may already be using it. With so many salons and independent colorists adding to their menu all across America & the rest of the world they may just not be listed yet. If not, please refer them to this blog for information and request it. If you do not have a colorist or salon and are interested in finding one that offers this service and carries Olaplex retail you may go to their web site at Olaplex.com and find a salon/colorist that does by plugging your zip code into the salon locator. If you live around the Rochester, Buffalo, or Batavia area please come make an appointment to visit my salon ->SherryMillersSalon.com. We offer it. Hope to see you at here. To all our faithful readers…until we meet again on my next blog, may you have healthy hair and a happy coloring experiences! *For more styling tips sign up or follow this blog, my web site at SherryMillersSalon.com . Sherry Miller is the owner of Sherry Miller’s Golden Chair Salon. She is an accomplished Colorist, Stylist, and Educator. Follow her blogs written here or log on to her web site and social media. This entry was posted in In-Salon Treatments and tagged #Olaplex #SherryMillersSalon #HairColor #ModernSalon #AllureMagazine #healthyhair #treatment #Color #Colorist #Salon #RochesterNY. Bookmark the permalink.